Today's manicure had innocent beginnings... and then grew into something much more than itself. Confused? You must not spend enough time on the internet! This image above was inspired by the "Yo Dawg" meme featuring Xzibit and inspired by Pimp My Ride. It's basically a reference to the outlandish things he would put in people's cars in the later episodes of the show. For example, if the person liked fish, the Pimp My Ride team would build an aquarium in their car. The first iteration of this meme went, "Yo dawg I heard you like cars so we put a car in your car so you can drive while you drive," pointing out the ridiculousness of the things they would add. So back to the nails. I painted these hands and tiny nails on my nails without thinking of this meme in particular, just imagining that I would call it "nails on hands on nails on hands." 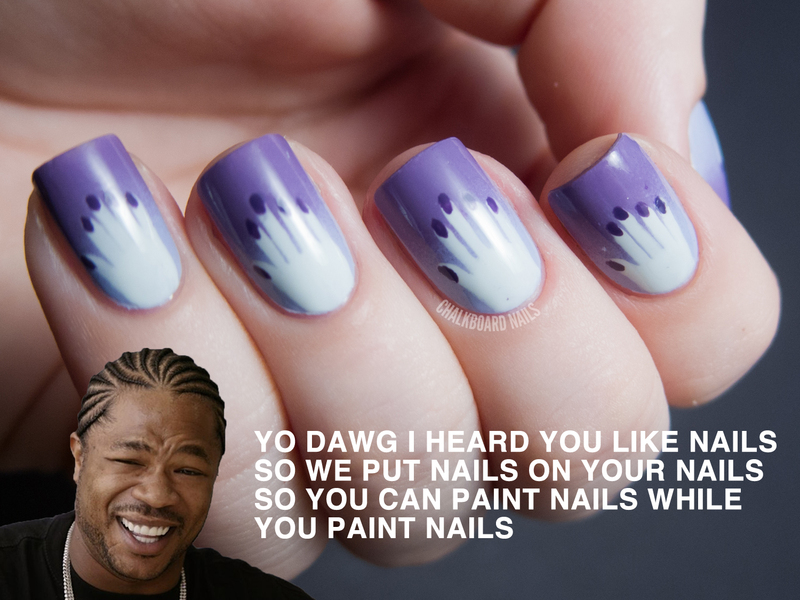 Then I showed Rebecca, and she immediately said, "You have to call it 'Yo Dawg I Heard You Like Nails." As soon as she said it I thought "Duh, of course I am going to do that. Who could ignore such a brilliant bit of comedy genuis." I began with a gradient base using American Apparel L'Esprit and Zoya Malia. Then, I freehanded on the tiny hands using OPI My Boyfriend Scales Walls. It was really frustrating to do the hands, but in the end I am happy with the way they came out. Then, I added the tiny purple nails in OPI Funky Dunkey. They were also pretty hard to paint, considering how small they are. I love the silliness of these. So, yup. That's today's nail nonsense! Even if you don't understand the meme reference, I hope you can still get on board with how reflexive these nails are! Absolutely love these! Super funny, too :D Can you please consider doing a week or two of meme inspired manis now?! I love these so much. This is the craziest, funniest, most awesome manicure I have ever seen. These are hilarious! I bet you had extra fun painting nails while painting your nails! hahahaha this is truly amazing! oh my god. you're my favourite. You have to do a weekly manicure that has to do with Facebook memes now. Lol. Maybe next week do an " overly attached girlfriend " mani? So cool!!! Seriously, I need to try this! You're so creative! This is hysterical! I love it! Until I read your text I just thought it was a purple flower! Haha wow! Hahahahah this is brilliant!! LOL Just sent this to people I know who like nails too (or like memes LOL). Epic! Love these, so clever! Brilliant! So cool. I love your fantasy, great to come up with this idea. Love it. Crazy and funny and nice ! Yo dawg, you totally nailed the nails on your nails! Not only is this a funny meme, it also looks cool as hell. Wow, genius! I love this! Funny and gorgeous at the same time, haha! Also they remind of purple kiwis. How awesome is that! These are probably the sweetest nails I've ever seen! Loving the reference! I seriously loled. Also, this is amazing, hands are so hard to draw! I died when I saw this!! Fantastic nail art AND sense of humor!! It completely made my day, so thank you. Hilarious!! Super creative, loved it. Ha, did you know your nails are on 9gag?? 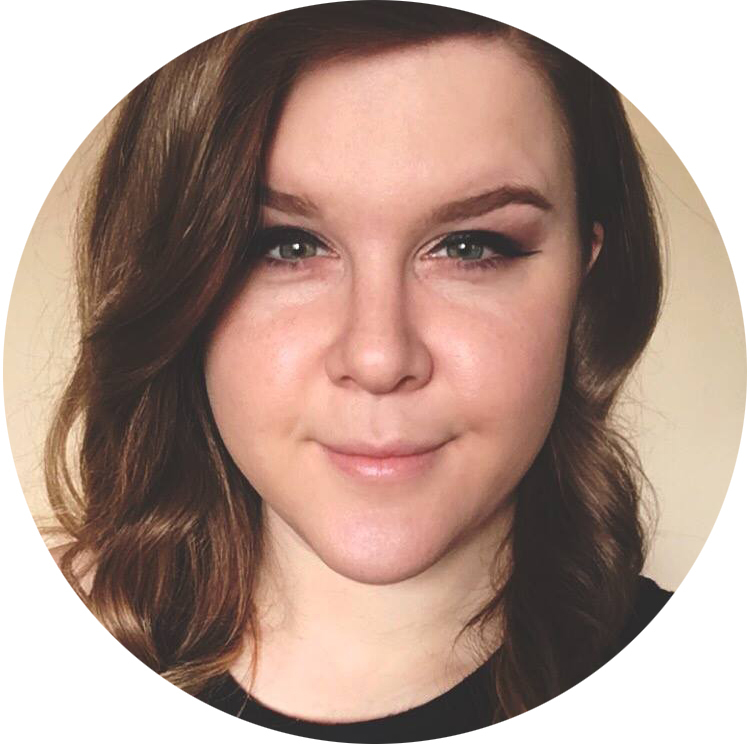 :) I also saw your nails on 9gag, nice nail art btw ! How am I just now seeing this?!! Geniusssss.